With all of the drilling in in the Gulf of Mexico, thousands of workers are dependent upon their employers and other contractors to provide a safe place to work and the right people and equipment to get the job done. Unfortunately, as we have seen with the Deepwater Horizon accident and other tragedies, the companies that run these job sites do not always put the safety of their workers first. If you or a loved one has suffered serious injury or wrongful death while working on an offshore platform, call Simmons and Fletcher, P.C. An experienced oil rig accident lawyer and our knowledge of the Jones Act are what you need on your side at this crucial time. Fixed-Platform Rigs. For tapping into shallow water mineral deposits, fixed-platform rigs are the most ideal and the most stable. A tall steel “jacket” rises up from the ocean floor and supports a platform above the ocean surface. They allow drilling down to roughly 1500 feet below the ocean floor. Many of these use a subsea drilling system to extract the oil at the ocean floor and pump it to the surface. The downside of these rigs are that they are very expensive to build and they are stuck in one place. They cannot be moved when a hurricane comes through. The cost increases the temptation of construction companies and contractors to cut corners and save money. This can result in serious safety issues for the workers. The lack of mobility means that there must be evacuation plans in place to ensure the safety of employees. Jack-up Rigs. Similar to the fixed-platform rigs, when these rigs are producing, they sit on steel legs above the ocean away from the waves. The difference in these, is that they start as a floating platform that is towed into the right position by way of barges. The legs drop down to the ocean floor and then jack the platform up out of the water. Less stability but more mobility makes these more useful for deeper water than a fixed-platform. Complaint Tower Rigs. 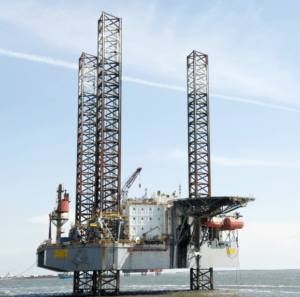 These offshore rigs operate much like fixed-platform rigs except they are taller and thinner. The design allows drilling down to 3000 feet below the sea floor but provides much less stability. They will sway back and forth with wind and waves, presenting a different set of safety concerns and hazards for workers. Proper training on how to avoid and prevent offshore injury caused by the instability is very important for workers on these rigs. Floating Production Systems. Useful in water depths of up to 6000 feet, these rigs float on the surface while pumping oil from far below. They may use anchors and chains to hold them in place or more modern ones use computerized thrusters to adjust location. The well-known Deepwater Horizon was a floating production system. Tension-leg Platforms. Allowing drilling in 7000 feet of water, these platforms float upon the ocean surface while long “tension-legs” anchor the rig to the ocean floor. It is a cost-effective way to drill into deep water oil deposits that might otherwise be too costly to recover. They present many of the same safety issues of being volatile to weather and waves. Spar Platforms. Modern Spar Platforms utilize a large single post known as a “spar” to hold the rig at the ocean surface in a pedestal style. These rigs can stand in as much as 10,000 feet of water. Each of the drilling platforms pose their own unique risks in addition to the common risks involved. Whether you were injured on the structure itself or in transit via boat or helicopter, you have a right to compensation for your injuries. If you have been injured or lost a loved one due to a maritime tort, you need to speak to an oil rig accident lawyer to learn your rights. Call us for a free consultation. Our contingency based fee structure means you don’t pay a dime unless we win you case, and case review with our attorneys are always free! At the heart of the practice at Simmons and Fletcher, P.C., is a commitment to legal advice, assistance and representation rooted in Christian values. Call now: 1-800-298-0111.